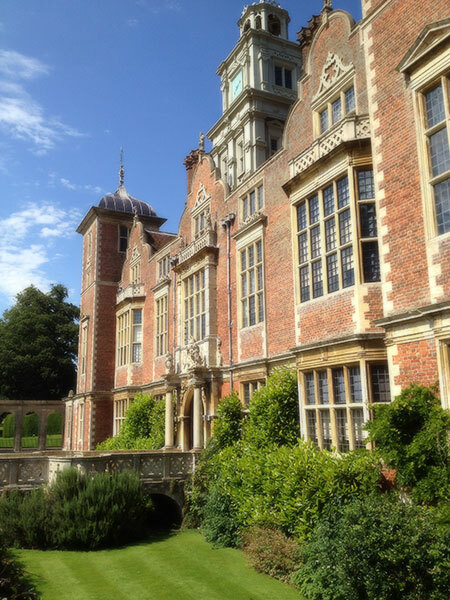 This is a magnificent Jacobean house with a garden and park. The Hall is famed for its long gallery, fine tapestries, paintings and rare books. There’s parkland and lakeside walks plus a sunken garden to discover. Reputedly home to the headless ghost of Anne Boleyn! There are various events all year round and it’s open from April to October. Superb Palladian house and ancestral home of the Earls of Leicester. Set in acres of parkland Holkham Hall has cafes and shops and events all year round. Sandringham is the country house of the Queen and Duke of Edinburgh. The main ground floor rooms are open to the public and house collections of porcelain, jade, furniture and family portraits. There’s a glorious 60-acre garden, garden folly, Queen Mary’s summerhouse, parterre, rock, alpine gardens, water and woodland. Oxburgh Hall is a moated and turreted Tudor house built in 1482. There are panoramic views from the top of the medieval gatehouse. Rich interiors, embroidery by Mary Queen of Scots and 16th century priest hole. It has 18 acres of French parterre, herbaceous borders, kitchen garden, orchard, woodland walks and wilderness area. Houghton Hall is an early 18th century house built for Sir Robert Walpole. It has 350 acres of rolling parkland, a collection of 20,000 model soldiers and militaria, heavy horses, gift shop and picnic area. There’s also a spectacular 5 acre walled garden, herbaceous borders, landscaped parkland, rose and sunken garden and parterre. Felbrigg Hall has remarkable Stuart architecture and a fine Georgian interior. It has a prolific library and Grand Tour collection. Outside there’s a stunning walled garden, orangery and orchards. There are plenty of lakeside, parkland and woodland trails to explore. Events are held here throughout the year. If you’re looking for a real Castle then this 12th-century keep with magnificent earthworks is just what you need! Experience an atmospheric visit to the old cells, hear tales of local witches, murderers and highwaymen or try out the stocks in the old market square. Windmill museum, tearoom, gift shop, bakery, garden and play area. There’s also fresh bread for sale. Located in East Rudham, near Fakenham, you can watch glassmaking at the Langham Glass Factory and listen to glassmakers as they demonstrate their skill. There’s also a video, glass information area and marble-based games tables. High wire forest adventure course in Thetford Forest with rope bridges, tarzan swings and zip slides. Trek from tree to tree through the forest canopy! The Iceni Village at Cockley Cley near Swaffham is a representation of a typical Iceni settlement of 2000 years ago. Walk through the gateway and experience the atmosphere of Iron Age Norfolk. Cosy Victorian fisherman’s cottage with recreation of 19th century life in Cromer. It has a geology gallery of amazing fossils found in Norfolk, childrens’ workshops, natural history walks and Victorian Living History days. Chelsea award winning nursery specialising in African violets, trees and shrubs with a café and visitor centre. Located in Terrington St Clement, near King’s Lynn. Not far from Diss are these five gardens covering 15 acres with an arboretum, herbaceous borders, dell, scent and woodland gardens. This is a fantastic private garden 1.5 miles from the North Sea. It has a large variety, including exotic, Dutch, Californian and sunken designs. Located in Saxthorpe is this heritage rose garden surrounding a medieval moated manor. Countryside nursery and specialist growers of culinary, medicinal and aromatic herbs. Set in beautiful wooded valley renowned for wildlife. England’s premier lavender farm at Heacham also has herb and fragrant meadow gardens. A rich variety of plants set in ten acres of natural beauty at Beeston Regis with hedge maze, herbs, roses, water, wildflower and woodland garden. Designed by Repton in 1812, Sheringham Park in Upper Sheringham has 20 hectares of specimen trees and rhododendrons, a garden folly, temple and landscaped parkland. Tranquil river and woodland walks in Little Walsingham with a spectacular display of snowdrops in spring. Very close to the Barsham Barns holiday cottages in North Barsham.